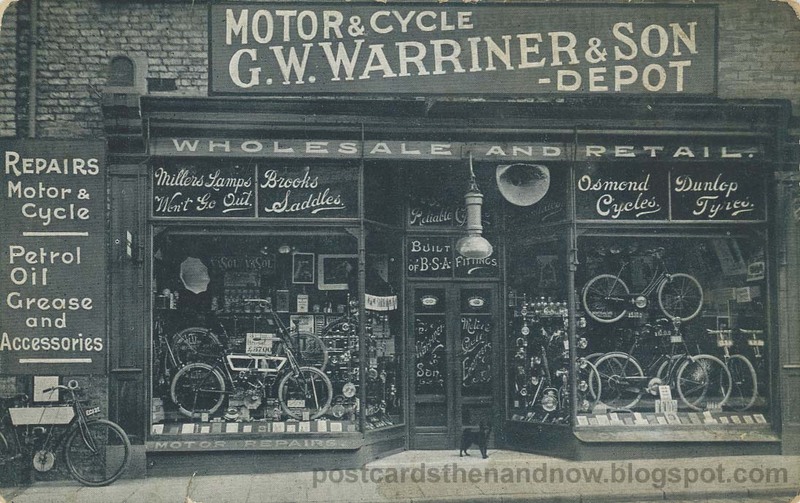 York, Micklegate, Warriner's Motor and Cycle Shop c1910. 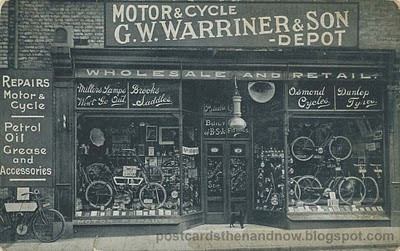 George William Warriner (1864-1949) had this shop at 138 Micklegate, York, close to the 14th century Micklegate Bar. In the modern Street View below, 138 Micklegate is the blue-fronted shop. It is now a knitwear shop called Bill Baber. In the old postcard view you can see a gramophone horn on display inside the shop. I think it was not unusual for early gramophones to be sold by engineers rather than music shops. Eagle-eyed viewers may also be able to spot a 'His Master's Voice' poster. I am not expert enough to tell you the make of the motorcycles in the window or outside, but if anyone can identify them it may help to date the picture more accurately. It looks like the motorcycle in the window is priced at £37. In the 1911 census Warriner described himself as a 'motor and cycle engineer', but in the 1901 census, when he was living not far away in Price Street, he was a 'bicycle maker'. In the 1891 census he was a guard on the railway. Both Warriner and his wife Annie were born in York, but curiously their daughter Dora was born in 1898 in Texas, U.S.A. Perhaps the Warriners spent some time in the U.S.A. while Warriner honed his engineering skills. This postcard was posted in 1910. Click to enlarge. Please visit Sepia Saturday for more old photographs. Fantastic old photograph postcard. So much detail and items to draw you in. I love the cycles. I wish I had those today! Great post and history. What a great looking shop. I'd like to see the knit shop. Wonder if they kept the same look or modernized the shop. Fantastic postcard, so much detail. I love the fact that you've shared the old photo and the new scene. I really enjoyed enlarging the postcard and looking at the details, and it was only after a few seconds that I realized there was a little dog in the doorway! How about that simple advert: "Millers oil lamps, won't go OUT! That's concise! It is a fabulous card and you do the theme proud. I agree with Kat, it is the type of image where the more you look at it, the more you see. (And, by the way, thanks for coming up with that additional information about E Gregson, I just assumed that when I found my first E Gregson, photographer of Halifax, he was the only one. I shall go in search of the other one now (perhaps an uncle). Oh yes wonderful! A bicycle shop! I so wanted to find one of these in all of my family photos, best I could come up with was a shop that sold Citroens! Thanks! Very cool! That's a beauty. I'd like to be able to take a little peek into that shop. Brooks Saddles are world famous; the firm was established in 1886. I live within 40 miles of York so I'll take a look at this location the next time I'm there. Modern shops just don't have the character like this one, which even has its own guard dog. It's so much fun to step back in time by looking at shots like this.